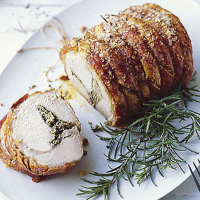 A delicious, scented roast that’s very simple to prepare. Preheat the oven to 190°C, gas mark 5. Remove the strings from the pork, then cut through the underside of the meat horizontally and open out flat. Place the fennel seeds in a mini chopper and whiz to grind roughly. Strip the leaves from the rosemary stalks and add to the chopper along with the garlic and some salt. Whiz to form a coarse paste (or grind in a pestle and mortar). Spread the paste over the cut surface of the pork and sandwich back together to form the original shape. Tie with string at 2cm intervals to secure the joint. Place in a small roasting tin and scatter over a little sea salt. Roast for 1 and a half hours, basting from time to time until crispy and golden. Check that any juices are running clear, then leave to rest for 10 minutes before cutting into eight thick slices. To get the best results, take the meat out of the fridge at least 30 minutes before roasting to ensure even cooking right through the meat. With soft, buttery flavours to complement the pork and the dense potato textures, this wine also has enough lemony acidity to hold its own against the brighter flavours of the seasoning in the broccoli side dish (see recipe overleaf).